Labor Day 2014 Online Savings at FurnitureCart.com! Looking for a great Labor Day furniture deals? We carry famous furniture brands such as Ashley Furniture, AICO Furniture, Coaster, Homelegance, Pulaski, Magnussen, Liberty Furniture or Kincaid, just to name a few, to complete your home furnishing projects for dining room, living room, bedroom or kid’s room. Find the item the way you want: by brand, room, style, material or color. Be sure to look at Top 10 furnishing ideas and new product listings. Benefit from the end of summer 2014 furniture savings online at FurnitureCart. Save shopping time this holiday weekend in order to visit your family and enjoy the company of friends. Browse thousands of items from our online catalog and shop from your relaxed home atmosphere! Do you live close to our Store Location? Receive 10% OFF on all orders shipping to Pennsylvania (PA), New Jersey (NJ), New York (NY), Delaware (DE), Maryland (MD), Washington (DC), and Virginia (VA). Use Coupon Code LOCAL10 during the checkout process or call our Customer Service to apply Discount. $500 minimum purchase required. Enjoy your Labor Day Holidays! Mother’s Day Furniture Sale 2014 at FurnitureCart! FurnitureCart congratulates all mothers with the most gentle, loving and caring holiday – Mother’s Day. And of course we don’t remain without gifts. Bedrooms, living rooms and kitchens by the country famous companies such as Ashley Furniture, AICO Furniture, Coaster, Homelegance, Pulaski, Steve Silver Furniture or Leather Italia are discounted. So you can buy any furniture for you and your family at a reduced price. To use a coupon and get a special discount, enter desired coupon code listed above during checkout process. Please note that some of the coupons have certain restrictions. Coupons can not be combined with other coupons and special offers. Only one coupon per person per purchase can be used. Coupons can not be applied to previous purchases. Save 5% on orders of $500 and up. Use Coupon Code FCSV5 during the checkout process or call our Customer Service to apply Discount. Save 7% on orders of $1999 and up. Use Coupon Code FCSV7 during the checkout process or call our Customer Service to apply Discount. Save 10% on orders of $4999 and up. Use Coupon Code FCSV10 during the checkout process or call our Customer Service to apply Discount. Can not be applied to AICO Furniture purchases. If you have any questions, please contact our Customer Service line at (302) 265-3830. Feel free to contact FurnitureCart.com. We will answer any questions and looking forward to hear any feedback you have. If you have suggestions, please contact us and let us know how we could improve! 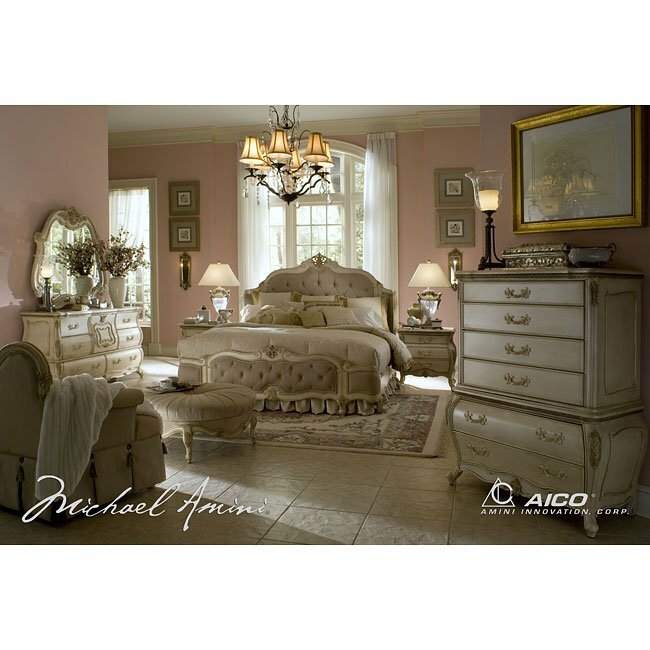 Imagine yourself in the grandeur and splendor of the Lavelle Blanc Collection by AICO Furniture from FurnitureCart that brings the influence of Regal French to life with traditional Old World carvings, scallop shaped pieces, and an antiqued white finish called Blanc. Solid birch is used in the collection because of its close grains, and satiny texture, which beautifully showcases the unique finish. 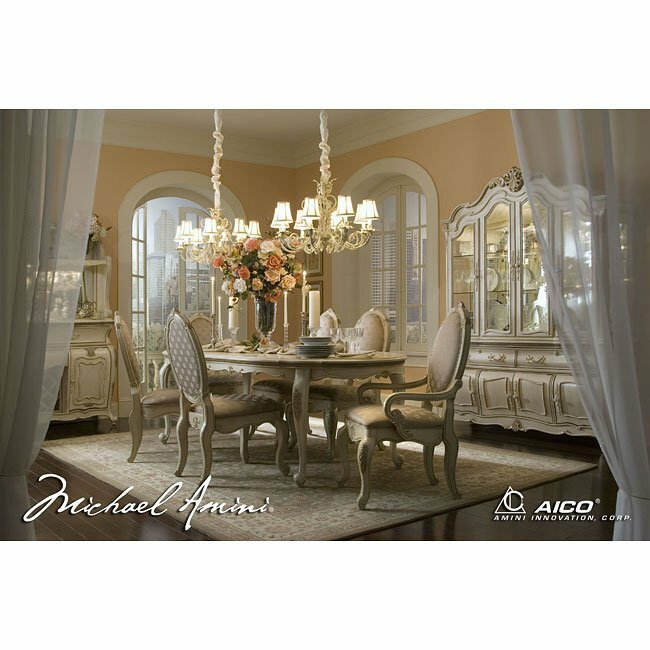 Featured in the series of Michael Amini’s Original Furniture Designs, this outstanding collection offers furniture ensembles for your dining room, bedroom, living room and entertainment area. The Lavelle Manson Bedroom Set offers a remarkable level of craftsmanship couples with the striking classical silhouette. It features a rich scalloped construction with the unique wing shaped and plush upholstered headboard and footboard accented with traditional button tufting and glazed platinum metallic tipping. Hidden drawers that conceal your valuables, velvet lining provides protection of delicate materials, and both English and French dovetail joints create a durable drawer, adding to the quality of this collection that will enhance your room while highlighting your style. Matching decorative hardware with Swarovski crystal accents and hardware with a decorative tassel on the dresser’s door provide elegant finishing touches, making the bedroom set a group you’ll love displaying in your bedroom. High-quality drawers are French dovetailed in the front and English dovetailed in the back for extra strength and durability at the joints, ensuring a lasting fit. Lavelle Dresser‘s bottom drawers are lined with cedar that exudes a pleasing fragrance while also helping to repel moths to protect your clothes. Drawer guides with ball bearings allow you to open and close the drawers smoothly and quietly. The Lavelle Living Room Set is complimented with hand carved occasional tables and accent pieces with Genius Swarovski Crystals inlaid beveled glass, and antique hardware, highlighting the design, detail, and style that are synonymous with Michael Amini Original Furniture Designs by AICO. The Lavelle Living Room Collection will add a sophisticated balance of comfort and luxurious design. It features a wide generously padded seat cushions and an elegantly shaped padded backs filled with high density foam and supported with the solid hardwood frame constriction. Luxury meets affordability in the spectacular designs of the Lavelle Dining Room Set from AICO. Using the combination of birch solids, natural birch and basswood Veneers, the set proudly displays the grains and satiny texture of the finest wood materials. Offered in the soft Off-White Blanc finish, the ensemble is composed of the leg dining table, side chairs and arm chairs. Italian designed and inspired, the fabulous Lavelle Collection will add originality to any home decor. FurnitureCart’s Marketing and Category Management team is back from sunny and fun Las Vegas! Monday through Friday, our team was at the Las Vegas Furniture Market in Nevada, scoping out furniture and casegoods from all around the world. We had a lot of meetings with existing suppliers to talk about how business is going, what new products they’re bringing out, what they see in the market, the trends. We also met with new people we’ve wanted to get on board with, that have unique products. n order to create a luxurious master bedroom you need to incorporate colors, fabrics and accents that are elegant and stylish. Almost everything, wall paint, furniture, lightning, curtains, and carpet has to be considered while planning a luxury bedroom décor. First, paint the walls in a color that gives you the feeling of luxury or use the wall paper with metallic accents and bold pattern. Buy a silk duvet cover, along with the luxury bedding. Mix and match silks, satins, suedes and velvets. Hang suede curtains on the window that coordinate with your bedding and place a velvet wing chair near it. Put antique area rug at the foot of your bed to give it a grand look. Replace lighting fixtures with luxurious fixtures, such as a chandelier hung over the bed. Choose table lighting that is both functional, yet elegant. Finally add furniture pieces that will bring luxury to your bedroom. Consider Bedroom Collections by AICO Furniture at FurnitureCart that has been known for its original, high quality and intricately designed home furnishings that make a grand statement in every home it rests in. Throughout the years, Monte Carlo has been built by some of the greatest architects of our world, and with the consistent climate, has drawn people from all over the world to be a part of its style, splendor, and brilliance. Finished in elegant beautiful wood finish named Silver Pearl applied to Ash Burl veneers over Birch solids, Monte Carlo II Collection can elegantly fit into any home and lifestyle, making anyone feel as though they are on vacation in Southern Europe. Villa Valencia® draws its inspirations from the city of Valencia, in Spain. The name itself comes from the Latin name of the city, Valentia, which means “strength,” and “vigor.” As it sits in the center of the Spanish Mediterranean coastline, Valencia overlooks the Gulf of Valencia, and is backed by mountains and rolling plains, creating a breathtaking environment. This area has seen numerous historical events, and as such, its character has continually developed. The Lavelle Bedroom Collection is finished in an antiqued white finish called Blanc, and is adorned with a glazed metallic tipping that highlights the traditional carvings. Imagine yourself in the grandeur and splendor of the Lavelle Collection that brings the influence of Regal French to life with traditional Old World carvings and scallop shaped pieces. Solid birch is used in the collection because of its close grains, and satiny texture, which beautifully showcases the unique finish. Hidden drawers that conceal your valuables, velvet lining that provides protection of delicate materials, and both English and French dovetail joints create a durable drawer, adding to the quality of this collection that will enhance your room while highlighting your style. 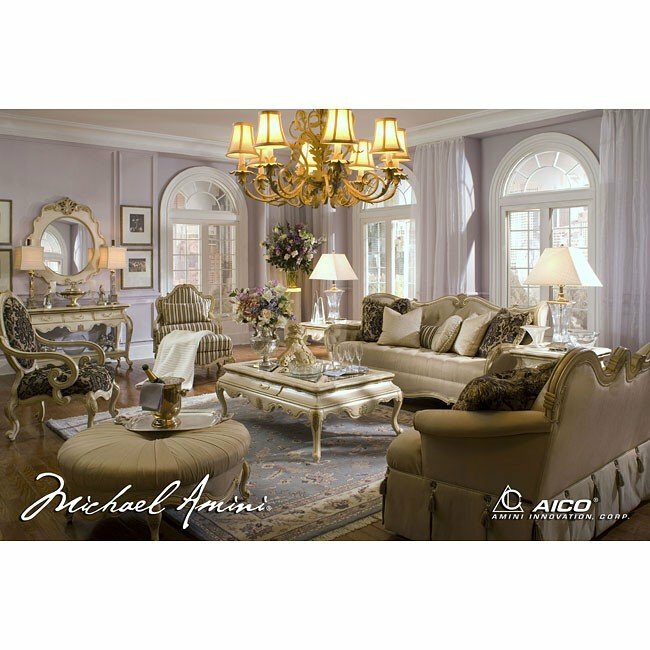 Adorn your home with Lavelle Collection to give it the design, detail, and style that are synonymous with Michael Amini Original Furniture Designs by AICO. Ensconce yourself in a Tudor revival bedroom suitable for King Henry VIII or create a romantic bedroom suitable for queen Elisabeth. In order to create a luxurious master bedroom you need to incorporate colors, fabrics and accents that are elegant and stylish. Almost everything, wall paint, furniture, lightning, curtains, and carpet has to be considered while planning a luxury bedroom décor. First, paint the walls in a color that gives you the feeling of luxury or use the wall paper with metallic accents and bold pattern. Buy a silk duvet cover, along with the luxury bedding. Mix and match silks, satins, suedes and velvets. Hang suede curtains on the window that coordinate with your bedding and place a velvet wing chair near it. Put antique area rug at the foot of your bed to give it a grand look. Replace lighting fixtures with luxurious fixtures, such as a chandelier hung over the bed. Choose table lighting that is both functional, yet elegant. Finally add furniture pieces that will bring luxury to your bedroom. We recommend Bedroom Collections by AICO Furniture at FurnitureCart that has been known for its original, high quality and intricately designed home furnishings that make a grand statement in every home it rests in. Magnificent architecture, grand casinos and the majestic Mediterranean landscape serve as the inspiration for the Monte Carlo II Canopy Poster Bedroom Set (Silver Pearl) by AICO Furniture. Throughout the years, Monte Carlo has been built by some of the greatest architects of our world, and with the consistent climate, has drawn people from all over the world to be a part of its style, splendor, and brilliance. Finished in elegant beautiful wood finish named Silver Pearl applied to Ash Burl veneers over Birch solids, Monte Carlo II Collection can elegantly fit into any home and lifestyle, making anyone feel as though they are on vacation in Southern Europe. The look and feel of Old World Spain have been beautifully captured in Villa Valencia Collection. Beautifully crafted from Birch solids with Cherry, Pecan, and Elm Burl veneers, the distinctive marquetry and intricate embellishments compliment a classic chestnut finish. Uniquely twisted and shaped marble pilasters with carved wooden leaves wrapping around adorn some of the pieces. Villa Valencia® draws its inspirations from the city of Valencia, in Spain. The name itself comes from the Latin name of the city, Valentia, which means “strength,” and “vigor.” As it sits in the center of the Spanish Mediterranean coastline, Valencia overlooks the Gulf of Valencia, and is backed by mountains and rolling plains, creating a breathtaking environment. This area has seen numerous historical events, and as such, its character has continually developed. Feel Like a Royalty in Your New Luxury Bedroom from FurnitureCart.com!